On the back of the revival of the seminal 'Want Love', Hysteric Ego begins to reveal the first cards of his hand for the 2013 summer season. The rejuvenated classic with Crazibiza and Jerome Robins is still in at the top end of the Beatport House charts, but work on something fresh for this year is already well underway behind the scenes. In a creative switch-up to compliment the imminent summer months ahead - Hysteric Ego is formulating a movement that’s aimed to turn heads in the underground with a new range of deep house creations. The Ego Has Landed EP’, their forthcoming three-tracker is no doubt a change of direction from recent releases - proof that Hysteric Ego is a man capable of adapting to change in the house world. With the launch of Courtois Music drawing ever-closer, these first tasters of the label's musical intentions will have organic house purists taking note. 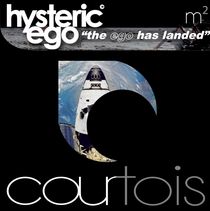 Hysteric Ego may have a worthy history in the house music world, but the arrival of Courtois Music proves label boss Rob is only looking forward this summer. If you're a connoisseur of the original temperament of house and the deep vibes prevailing in today's sound, then Courtois may be a label to keep an eye on.